The 37-year-old led his club to their fourth All-Ireland success in eight years. Ollie Canning celebrates Portumna's victory. OLLIE CANNING SAYS he will ‘probably be dragged kicking and injured out the door’ but has no intentions to retire from hurling soon. The 37-year-old led Portumna to their fourth All-Ireland senior hurling club championship success at Croke Park on St Patrick’s Day but is not quite ready to leave at the top of his game. Canning, who contributed three points in his side’s triumph over Mount Leinster Rangers, joked he would try to keep up with his younger teammates as they celebrated success back in Galway. He said, “I remember [Dublin footballer] Ciarán Whelan did an interview a few years ago and said every interview he did, they were asking him ‘are you going to retire?’ I’m finding that a bit. The veteran said his side’s focus was on their own game rather than what outsiders Mount Leinster would bring to the party. The age profile of the champions, he admitted, was on the wrong side of 30 so ‘kicking on’ may prove an issue in the coming years. “Our goal at the start of the year,” he said, “was to win the county Championship in Galway, which is a very difficult Championship to win. Once we won that, it was a great achievement for this team to come back and do that. Monday’s victory was Portumna’s fourth club title in eight years and Canning was reluctant to declare the latest win as the best. “It is special to come back, I suppose. I don’t know if you can ever surpass winning your first one, back in 2006. That’s was an unbelievable achievement for the club,” he said. “It is very special,” added Canning. “Especially when you’ve been away for a few years, and maybe written off in some quarters. But that’s the way it goes. It’s not unusual. For a team to contest three All-Ireland club finals and then not get out of their own club championship for the following three years, it is a bit of a decline. 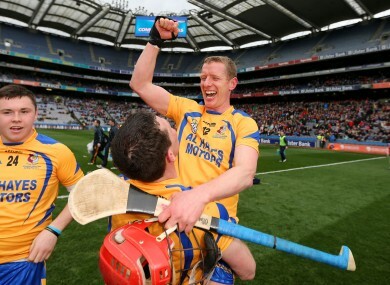 Email “Veteran Portumna captain Ollie Canning has no intentions of retiring yet”. Feedback on “Veteran Portumna captain Ollie Canning has no intentions of retiring yet”.